Therefore, I urge you, brothers and sisters, in view of God’s mercy . . . Here Paul is speaking to us Christians. It is possible to commit our lives to the Lord for the purpose of salvation and yet not be yielded to the Lord in our daily lives. It is only when we make the total sacrifice in every area of our lives that we begin to see God’s perfect will manifest through our lives. desires daily. This has to be a living, ongoing commitment to the Lord. This is your true and proper worship . . . Many Christians think that living lives totally consecrated to God is something that only preachers or a few religious people do. They see it as “extra” and “not normal” Christianity. However, Paul said this level of commitment is true and proper worship. Jesus died for each one of us, so each one of us ought to live for Him. If we think on the same things that the world thinks, we are going to get the same results. If we keep our minds stayed upon God through the study of His Word and fellowship with Him, then we will have perfect peace (Isaiah 26:3). It’s that simple. 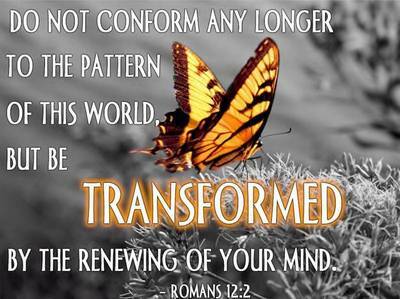 But be transformed by the renewing of your mind. . . The word “transformed” is describing a complete change, like that of a caterpillar changing into a butterfly. This word is also the same word that was used to describe Jesus’ transformation when His face shone and His garments became white as the light (Matthew 17:2). Making our thinking line up with God’s Word will affect this complete transformation in our lives. When people are born again, they become totally new creations in their spirits. Their spiritual salvation is complete. “For in Him dwells all the fullness of the Godhead bodily; and you are complete in Him, who is the head of all principality and power” – Colossians 2:9-10. However, it is not God’s will that we only be changed on the inside; He wants to manifest this salvation in our physical lives also. That takes place through the renewing of our minds. If we fail to renew our minds, we can live our entire time on this earth without experiencing the abundant life that Jesus provided for us (John 10:10). Then you will be able to test and approve what God’s will is—His good, pleasing and perfect will . . . Finding God’s will for our lives is not hard when we do what these verses instruct us to do. As a matter of fact, it would be impossible to ignore God’s will once we commit ourselves to Him as living sacrifices and begin to renew our minds. Finding God’s will for our lives only becomes hard if we are not totally committed to the Lord. God’s will for all of us is to be living sacrifices to Him. Once that is accomplished, more specific direction will come as we renew our minds.